Over the past several decades, we’ve found out how bad cigarettes truly are for us. 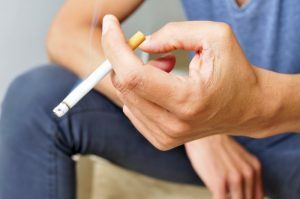 Smoking tobacco increases our chances of getting heart disease and other serious diseases not just because of the tobacco, but also due to all the added chemicals. As a result, many people have switched to using vaporizers to satisfy their nicotine cravings guilt-free. However, if you plan on getting dental implants in Longmont or having good oral health at all for that matter, is it still a reasonable alternative? We know smoking isn’t good for us, but did you know that people who smoke or use tobacco products are at twice as much risk of getting gum disease compared to those who don’t? According to the Centers for Disease and Control Prevention, smoking weakens your body’s ability to fight infections because it negatively affects your immune system. This also makes it more difficult to heal if you develop gum disease either from smoking or from poor oral hygiene. If that isn’t enough, smoking stains your teeth, causing your tooth enamel to yellow over time. It also makes your breath stink, even if you brush regularly. The combination of chemicals and tobacco leaf is just too much for your mouth to handle, so no amount of brushing or mouthwash will remove it. The only way is to quit smoking entirely. Is Vaping a Viable Alternative? Vaporizers and e-cigarettes have been touted as far healthier alternatives to the traditional tobacco products. According to a report published by Public Health England, most of the chemicals that cause smoking-related diseases are absent in fluids typically used in vaporizers. Nicotine use has also been known to mask the symptoms of gum disease, which is especially bad if you’re trying to get dental implants, according to your implant dentist. Any implant dentist will tell you that if you want to get dental implants, you need to have healthy gums. If you have gum disease, you’re far more likely to experience tooth loss because the gums can’t sufficiently hold your teeth. Habits like smoking and vaping only increase the chances of contracting gum disease, which inevitably leads to tooth loss. Additionally, if you intend on getting dental implants in the future, keep in mind that smoking or vaping either before, during, or after dental implant treatment will only increase the chances of implant failure. According to your implant dentist in Longmont, smoking and vaping should be avoided at all costs if you want to keep your teeth or get dental implants. Want to learn more about improving your oral health or find out your eligibility for dental implants? Schedule an appointment with your dentist today! Dr. Dan J. Maurer earned his Doctor of Dental Surgery degree from the University of Colorado School of Dental Medicine. During his dental program, he interned at many Salud clinics in the area. To learn more about dental implants or his practice, contact him at (303) 776-2214 or visit his website.